Welcome! Our mission as the Office of Arts & Culture is to enhance living and learning through arts and culture on campus and in the community. We further this mission by supporting the creative endeavors of our students and our community. 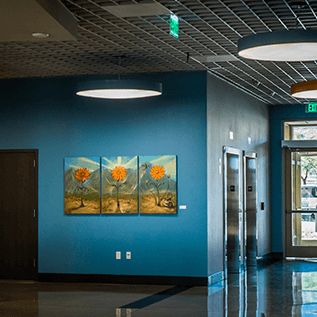 Some of these endeavors include: The Artist at Work, The Campus as Museum, Nevada State College Student Galleries, temporary exhibitions, and unique cultural events and community partnerships. Above: Artwork in RSC facing Mt. Scorpion. 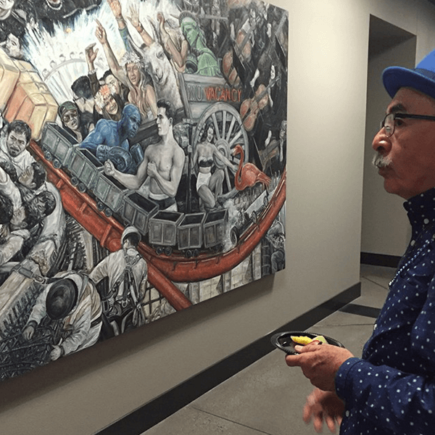 Left: United States Poet Laureate, Juan Felipe Herrera, viewing A Requiem for the Outsiders. 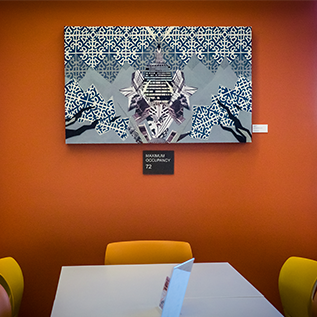 BE TRANSFORMED by our permanent collection featuring more than 70 works by 34 local artists hung throughout public spaces in our main campus buildings and plaza, and temporary exhibitions we host throughout the year. 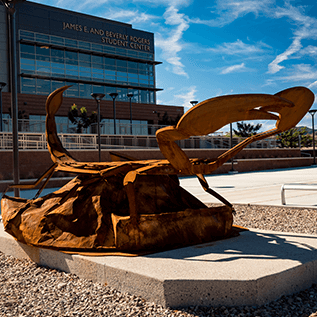 We offer a rich variety of free public programs and invite you to explore our art-infused campus. Check out our events calendar and BE PART OF ART at our poetry readings and workshops, musical performances, film viewings, lectures, seminars, and other creative workshops. 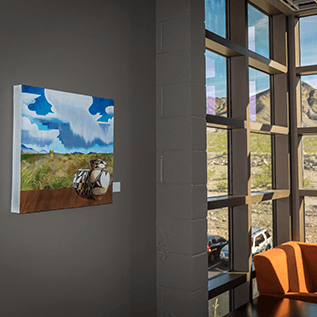 Your gift supports inspired initiatives like The Artist at Work, The Campus as Museum, Nevada State College student galleries, temporary exhibitions, and unique cultural events and community partnerships. Click below to find out more.